Due to hardware compatibility problem, some Ubuntu laptops’ screen brightness reset to the lowest or highest on every boot. It’s inconvenient to configure the screen birghtness on every login. 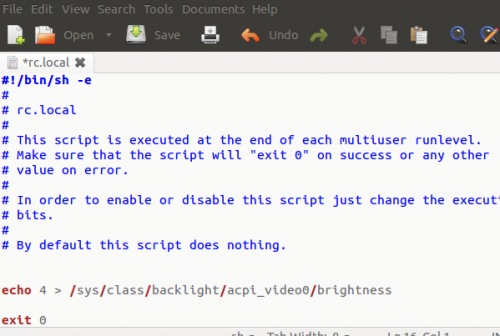 Here’s a way to save the screen brightness settings in Ubuntu laptop. 14 users responded in " How to Save Screen Brightness Settings in Ubuntu 12.04 Laptop "
I have this screen brightness problem on an Ubuntu 12.04 desktop machine with the ATI Radeon 9000 Series VGA. The /sys/class/backlight/ directory is empty (what can cause this?) and I’d say I can’t set the brightness using the method you suggested. Thanks a lot mate! Worked like a charm! does not exist on my system. Thank you, Meilin. It works for me. My current computer is a dell inspiron 1764 with an ATI/AMD graphics card and I originally had Ubuntu 12.04 before I went to the 12.10 upgrade. Now after that, I decided to go back to 12.04.1 and tried this method. Problem is that the brightness keeps coming back after trying this method that worked with no problems back when I had 12.04 originally. Hi, the solutions offered here are somehow system-dependent. A good design is to have one place that takes care of system-dependent details and provide a unified interface. It seems that currently the kernel does not offer such an easy interface through `/sys`. At X level, though, there is one : `xbacklight`. A solution based on `xbacklight` is offered on http://askubuntu.com/questions/66751/how-do-i-set-default-display-brightness/232668#232668, for 11.10 and up. Plus, it should not have the problems explain by S.A. above ( October 20th, 2012 at 4:49 am ). Thank you very much, works for me! I came around back to this and I do have xbacklight installed and before you gave me this solution I put this in on startup applications and it does work… 1/4 times. Sometimes while the screen dims after the splash screen, the screen breaks and goes black forcing me to restart. Anyway I have put the lines as you mentioned however when I restarted it just snaps back again to the max brightness. The last lines of the code were hard to figure out but I’m I doing this right? thank you. It work perfect!